High school roommates Andy Roddick and Mardy Fish headline Saturday's semifinal action with their eleventh career meeting. The No. 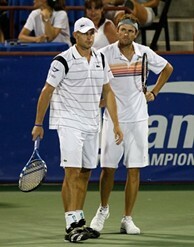 1 seed Roddick defeated No. 7 seed Xavier Malisse in three sets to advance, while counterpart Fish defeated fellow American Taylor Dent 6-3, 6-0. John Isner also advanced with a 56 minute victory over Michael Russell and will face South African Kevin Anderson in the opening match on Saturday afternoon.